Overseas visitors to the UK spent £22.5 billion in 2016. Visits to Britain grew by almost double the European average in 2016. With record visitor numbers and billions being contributed to the UK economy, Britain’s inbound tourism is world-class. It supports jobs, boosts growth and puts the UK’s national brand at the centre of the global stage. In 2016, the UK achieved a record £22.5bn in inbound visitor spend, up 2% in nominal terms on 2015. Also up 4% on 2015 were total overseas visits, reaching 37.6mn in 2016. In the first seven months of 2017 alone, the UK achieved 23.1m inbound visits – up 8% on last year – with July 2017 the first month ever to record 4m visits to the UK. 2016’s growth was led by visits to friends and relatives (VFR), with 11% more visits than in 2015. Holiday visits were flat in 2016 overall but picked up at the end of the year, with 13% growth in October-December. 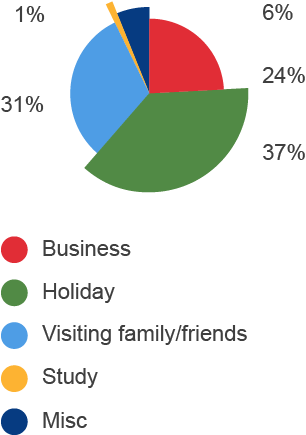 Holiday visits were up by 19% in the first seven months of 2017. Business visits – a key priority for VisitBritain – grew by 4% in 2016 to 9.2m. That’s a seventh straight year of growth that surpasses even the record high set in 2006. £713 was spent by inbound tourists per second in Britain in 2016. 2016 saw tourism reach far and wide in the nations and regions of Britain. In 2016, London remained a global tourism powerhouse, as visits increased 3%, reaching 19.1m, to achieve £11.9bn in visitor spend. Overall, visits in England outside London grew 5% in 2016, so more of regional England welcomed tourists from around the world. The East of England (up 10%) and East Midlands (up 19%) achieved particularly strong growth. Visits to Wales saw an 11% rise with spending up 8%, whilst Scotland welcomed 6% more visitors than last year. Edinburgh was the second most visited city in the UK, with 1.7m inbound visits, spending £822m. Manchester was third, with 1.2m visits spending £475m. Cardiff welcomed 357,000 visits, spending £110m. Scotland welcomed 451,000 visits from its top inbound market the USA in 2016, up 10% on 2015. Germany was the leading source market for regional England in visits terms in 2016, with 1.5m visits. 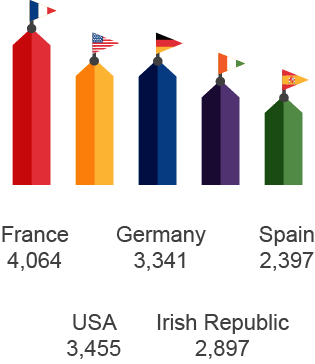 For Wales, Ireland was the top market in visits terms, with 169,000 visits, up 31% on 2015. British inbound tourism is amongst the world’s best, comprising 5.1% of global inbound visitor nights. The 2016 Anholt Nations Brand Index survey ranked the UK as the fifth most aspirational destination to visit, if money was no object. The UK’s tourism performance in 2016 was similar to the global average, with total global overnight tourism visits growing by 3.9% according to The World Tourism Organisation (UNWTO). In Western Europe, the UK alone accounts for 15.1% of inbound visitor nights. Britain performed strongly compared to the continent, with visits to Europe (up 2.1% in 2016) growing by only half the rate of the UK. The UK remains competitive with Italy (up 3%) and the Netherlands (up 6%). And whilst Spain and Ireland both achieved double digit growth, France, Belgium, Turkey and Russia suffered declines in visitor numbers. Britain is becoming more accessible than ever before, welcoming tourists from a diverse range of international markets. Direct air capacity to the UK rose 10% in 2016 compared to 2015 and is projected to be up a further 6% in 2017. Seat capacity from the United States grew by 9% in 2016, China by 13% and the United Arab Emirates by 11%. Capacity from Brazil fell by 15%, largely due to a severe recession. People visit Britain from all over the world. Europe remains a crucial market for British tourism, despite the political uncertainty over Brexit. Visits from the EU15, the UK’s largest visit-generating region, grew by 4% in 2016 to 20.7m, whilst the Eastern EU saw a 12% rise, to 4.7m. North America, another key market, reached 4.3m visits – up 8%– with visits from the USA up 6% and Canadian visits up 17%. The United States is our most valuable visitor source market, with American visitors spending £3.4bn in 2016, an increase of 11%. There were 260,000 visits from China in 2016 with visitors spending £513m. Visits from China were 138% higher than in 2010. On average, Chinese visitors spend £1,972 per visit. For every 22 Chinese visitors we attract to Britain, another tourism job is created. "With record visitor numbers and billions being contributed to the UK economy, Britain’s inbound tourism is world-class."